Accommodation Department: Front desk staff, Bellman, Concierge, etc. Accounting Department: Income audit, Account payable, Account receivable, etc. The Westin's brand concept is "WESTIN Let ’s Rise! We offer a unique program to provide you with peace of mind and vitality so that you can have a more uplifting feeling than before your arrival. We cherish the Westin brand while keeping in mind the unique "hospitality" of Japan a country of sensitive concern. We are looking forward to your joining! Let's work hard together to develop our brand in this excellent environment. Due to being a general hotel including the world's leading Marriott group's hotel chain and business hotels, so we require our employees to have the ability to respond flexibly to diverse jobs, a great challenging spirit and, above all, a passion. Those who are willing to meet high demands have a great prospect of fulfilling through their daily work and a brilliant career. With the aim of becoming a hotelier with a world in mind, we are looking forward to receiving entries from those who have full of hospitality minds and full of enthusiasm and motivation. ※ Give customers guidance to accommodation procedures and rooms, inquiries during accommodation, facilities . ※Besides serving drinks and snacks, the Executive Lounge staff also need to do reception services such as check in and out. * Westin's unique service includes 'Service Express', and offers hotel services such as guidance in the lobby, guidance, and room delivery, room service, concierge, call center for picking up calls and inquiries from rooms, etc. It will be a department that will do almost all consistently. Food and beverage department: Restaurant service, restaurant reservation, banquet service, restaurant reservation, bartender, etc. ※ We will provide food and drink at the restaurant, guide to the seat, and charge general service for banquets and wedding receptions. ※ You can propose unique hospitality and manners. In addition, you will gain knowledge of wine and sake such as sake, and knowledge of cooking, so you can aim to obtain qualifications for sommeliers, rickets and restaurant service skills certification (HRS certification). 世界中のマリオットグループのホテルが従業員料金で利用可能 Marriott group hotels worldwide are available at employee rates. 当日ブースにて説明致します。 More information will be provided at our booth. ・A good team player who can understand the feeling of other members and caring the others. 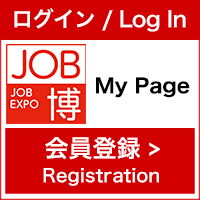 Please submit your resumes and career sheet (Japanese and English) via post or e-mail. Our hotel is an international hotel in the heart of Tokyo. We believe that our hotel will be the best workplace where you can build a comprehensive range of hotels and learn about world class service standard by the Marriott Group.